Woman power: Chairman and CEO of PepsiCo Inc. Indra Nooyi. New York: Indra Nooyi was named the most powerful businesswoman in the US by ‘Fortune’ magazine for the second year in a row. Nooyi, the first woman chief executive of food and beverages giant PepsiCo Inc. continues her reign, while beating competition from familiar foes —Xerox’s Anne Mulcahy and eBay’s Meg Whitman. 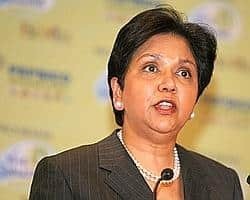 The 2001 Quaker Foods acquisition, in which Nooyi played a key role, was working out well and Pepsi International, a priority for the company is coming on strong, too, it said. The company’s revenues rose 14% to $13 billion and operating profits increased 21% to $1.9 billion over the last year. ICICI Bank’s Chanda Kochhar jumped four ranks from last year to 33rd in this year’s list. She oversees more than half the bank’s $6.7 billion revenue, its presence in 18 countries and its involvement in most overseas acquisitions by Indian companies. “Kochhar, 45, is one of two women on the bank’s board and is seen as a strong CEO candidate in 2009," the magazine said. Likewise, HSBC India chief executive Naina Lal Kidwai improved her ranking by two positions to 38 leading one of India’s fastest growing bank, with net profits rising 64% to $192 million on $1.1 billion in revenue during the past fiscal year. She launched a life insurance joint venture and plans to expand small-business and retail banking activities, the magazine noted. However, Biocon chief Kiran Mazumdar-Shaw slipped two spots to land at 50.